In my previous post, I mentioned that I received an email from a gentleman by the name Michael Frost who generously offered to share his photos with me and Peter. I must sincerely apologize to him for getting his name mixed up. Michael Frost was the name in the ‘Sender” of the email. But his actual name is Arthur Poskitt. I reproduce below excerpts of his emails to me first and then to Peter as well. Hallo I would like to introduce myself. 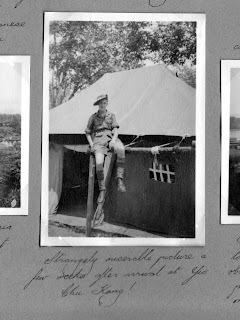 Arthur Leonard Poskitt (80) I served in Singapore as a Signalman and ran a drawing office at a village called Yio Chu Kang for about eighteen months with the Royal Corps of Signals. My main duties were supervising line parties to repair underground communication cables and service test huts as the location of all underground cable routes were destroyed at the onset of the Japanese occupation. While I was in Singapore I took the opportunity of taking several hundred pictures of the area through the eyes of a national serviceman. I covered the whole Island from the Causeway and the southern islands then known as Blakang Mati now known as Santosa, Paulu Brani and other islands in the area. Pictures include army life under canvas and city street scenes which no longer exist! I found your blog/website and thought you might be interested in the above. 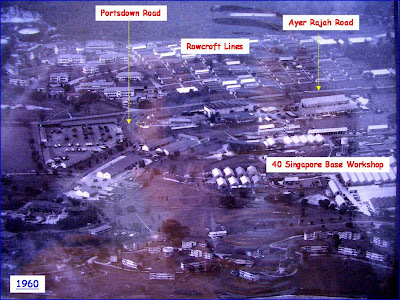 Regarding army service, I departed from Liverpool on the White Star liner 'Georgic' (then converted into a troop ship) in December 1947 arriving at Nee Soon transit camp in Singapore in January 1948 and thence to join the Singapore District Signal Regiment at Yio Chu Kang and put in charge of the drawing office. My duties took me across the Causeway to Johore Bahru and further north until curtailed by the terrorist insurgency of 1948. This did not prevent me from taking leave in both Penang and Kuala Lumpur traveling by steam train. My close-knit group of army friends seem to spend a lot of time at the cinema. Does the Pavilion cinema and restaurant on Orchard Road still exist? Also the Cathay, once the highest building in Singapore! The Shackle Club will have long gone. We also spent some Saturday nights watching wrestling at the Great World arena. Hereby lies the problem. I have no prints except an album with captions and very substandard contact prints produced on return to England in July 1949 and thus unable to provide a sample. Everything is digital these days! You tell me you are interested in all things military in the late forties and this is all here, together with street scenes (ie: ancient tramcars on the Serangoon Road), country kampongs and rubber plantations in which we lived under canvas during the interminable monsoon. I also have pictures of the war cemetery at Kranji and the ancient graveyard at Fort Canning. Not only do I have negatives but also kept a very extensive diary of army life. Even the original camera still exists! Though now approaching my eightieth year I still travel extensively when my work as an advertising artist permits. Journalists with whom I have worked and count as friends say that I have enough material for a book and would hate to think that on my demise this unique and valuable archive might be lost forever. 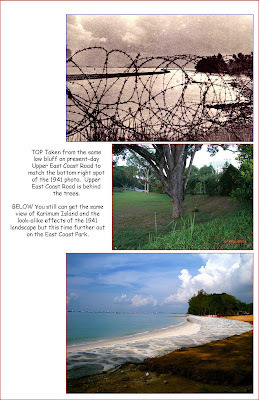 This is a follow-up to “WW2 at Upper East Coast Road” which was posted on Chun See’s blog on December 09, 2009. Three questions were asked. 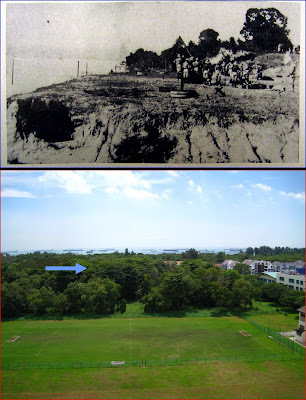 1) Where was the location of the Bedok Hill Massacre site? 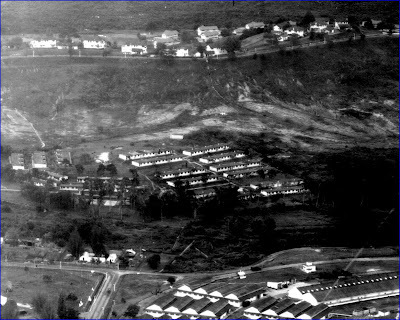 Photo 4a was taken from the direction of a hill (blue arrow in modern-day photo) where there used to be a Chinese school. The Chinese school was later flattened to become Bedok South Road and Kew Residencia. In that same photo, a road could be visible between the sea and the low bluff. That is Upper East Coast Road; the stretch between Parbury Avenue and Bedok South Ave 3 today. For my “modern-day shot”, Block 163 was used because there was no suitable elevation to replicate the same 1941 photo. Somewhere behind the fence was the location of the 1942 “Killing Field” (blue arrow). At that time a small Chinese settlement stood at the edge of the fenced-up forest and Temasek Primary School. It was reported that sympathizers from this settlement gave shelter and provided emergency medical aid to the survivors. In 1981, the government announced plans to build the Changi General Hospital on the open space bounded by Blocks 155 and 163 on one side, Bedok South Road and Upper East Coast Road. It included the fenced-up forest. We learnt that the decision was reversed in favour of the Simei site. Today the open space is now shared by week-end footballers and the HDB residents except for the fenced-up forest. But why is the forest the only area still fenced-up? Was it because there was an ugly “past”? 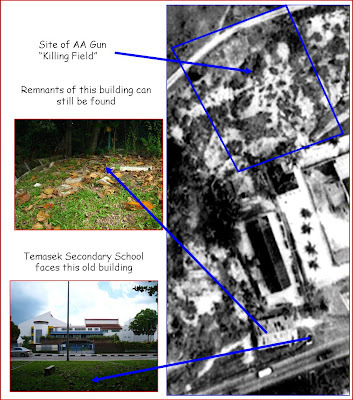 Whilst the nearby hills of what is now Bedok South precinct were leveled down, the Tanah Merah Powder Magazine was left intact until the mid-1970s when the SAF Bomb Disposal Unit was detailed to clear the area. 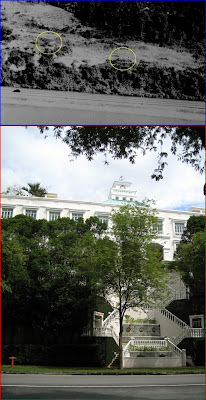 In the early 1960s, I saw the building which had a brick wall facing Upper East Coast Road. For some reasons I was told by my cousin not to walk on that side of Upper East Coast Road. In the early 1970s on bus trips to Bedok Camp, I saw shrubs and trees growing wildly, and it was unusually dim. I can only think that the Baily bridge was blocking off the sunlight. The once powder magazine lies inside the fenced-up forest. The building foundation of the military barrack is the only piece left from the past, although there are traces of either a broken asphalt road or dirt track leading into the powder magazine area. The “State Land” signboard marks the exact spot of the entrance into the powder magazine. From the grapevine, there are “talks” that one of the stations on the Eastern Regional Line - the future MRT line from Marina Bay to Changi Airport - will be here. In late 2009, the Land Transport Authority appointed Soil & Foundation to carry out soil investigation along Upper East Coast Road. Bedok W/T Station (Photo 3a) is now the clock tower of Kew Green, a condominium off Kew Drive. The gradient of the hill (of 20 feet contour interval) is now replaced by four banks of vertical retaining walls to prevent soil erosion. Today this place is full of tranquility and close to man-made nature. At one corner of Bedok South Estate, are the private landed estates and condominiums. Accessibility is so much better than in the past; to major expressways, the airport, outdoor amenities on the East Coast Park, food centers, schools and wet markets. Did you know you can consult a General Practitioner for less than S$15 and there are four to choose from within 2 minutes walking distance? Recently, I received two wonderful gifts in the mail. The first is Derek Tait’s latest book; More Memories of Singapore and Malaysia. Readers would probably know that this is Derek’s third book about Singapore. I have not read it yet, but flipping through the pages and seeing all those wonderful photos of the old Singapore is already a great fun. I gather that much of what is written in this book is a compilation of stories sent to him by friends; British folks like Tom O’Brien, John Harper and Brian Mitchell who spent a few years of their childhood here when their parents were stationed in Singapore as military personnel in the sixties. I am much inspired by Derek’s books and have decided that I too would like to compile stories from this blog into a book. I take this opportunity to thank guest bloggers and readers for their stories. The second gift was in the form of an old photo album sent to me by Russ Wickson who earlier sent me this email. I have had much enjoyment reading through 'Good Morning Yesterday'. I was stationed with the Royal Air Force firstly at Tengah and later at Changi between May 1965 and November 1967 when I was returned to the UK. Like so many of your readers and subscribers I have a plethora of fond memories and I have never given up the hope of returning one day to root around old haunts, although I suspect many have disappeared as your site suggests. 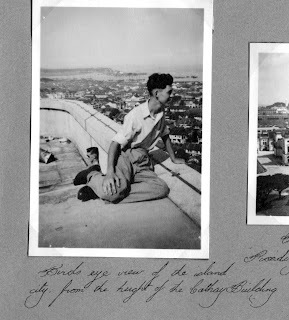 Anyway, the purpose of this email is to say some years back now I was given a small photograph album by an RAF chap who served in Singapore 1946 to 1948. The album contains small black & white prints and I'm wondering if it might be of use to you. I'm sure with all the modern technology available these days those prints considered suitable could be reproduced and may give pleasure to others, but of course that would be up to you to decide. And thus this mouldy but precious old album arrived in the letter box together with a small book entitled, History of Changi - original 1960's print. Russ explained in his cover letter that this photo album was actually given to him about 10 years ago by an elderly gentleman by the name of George Shaw. George loved his time in Singapore but was sad that his own children had no interest in his past and thus “would love someone like yourself to have the remains of the album and to do what you will with it”. (He said ‘remains of the album’ because some photos were missing from it. Besides Russ Wickson, I have also received photos from people I have not met before like Robin Brewster who emailed me those photos of the elephants exercising at Seraya Crescent, Gordon Carle who emailed me several photos of Chestnut Drive, Bukit Gombak and Bukit Panjang. And then there is Michael Frost. I tell you more the next time. I have said many times in this blog that I wished I had more photos of the old Singapore to illustrate the topics I blog about. Thanks to these generous and thoughtful friends from the UK, I will have plenty of things to blog about and can take on lots of “2nd Shot” (Then and Now) projects in the future. On behalf of friends of Good Morning Yesterday, Thank you very much, 谢谢, terimah kasih. Have a blessed Lunar New Year everyone. 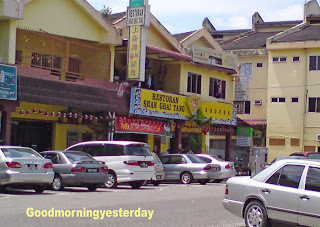 Recently I was in Tangkak and saw this interesting sign outside a Chinese restaurant. Can you spot the error? What do you think is the name of this restaurant in Chinese? This sign reminds me of a documentary I saw about a group of people who went around public places in Beijing to spot signs with bad English. This was during the period before the 2008 Beijing Olympics. Alex is right. The signs says 上海灘 (Shanghai Bund) in Chinese which is actually the title of a classic 1980 TVB period drama series starring Chow Yun Fatt. I did not like the series and have not watched it. Nowadays people identify this title with the theme song sung by Francis Yip who once said that she has never appeared in a concert where the audience did not demand that she sang this song. A perennial karaoke favourite it was one of several memorable hits penned by Joseph Koo. Speaking of Cantonese drama series, they were very popular in Singapore in the 70’s when RTS still aired dialect programmes. I think without doubt the most popular were the two series Men in the Net and 亲情 (cannot recall the English title). On evenings when the show was being aired, it was reported that you would not be able to hail a taxi because the drivers were all glued to their tv sets. For a while the most popular phrases among Singapore boys were; “Lei yau moe kau chor” and “Chee sin!” (crazy). 1966 marked the beginning of the second Singapore 5-Year Plan. The road network for Singapore was prepared in this second Plan. A major road termed as the Pan-Island Expressway was first mooted in this Plan to serve as a major route to link up new towns under construction, e.g. Jurong, Toa Payoh, Kallang Industrial Basin and other proposed new towns (Woodlands, Teluk Blangah and Changi). It was proposed to be dual 3-lane road with limited controlled access points to the expressway. There are two ways to design/build an “expressway”. One is based using existing roads. The other method is to build a new route through forest, cemeteries, acquired estates and inhabited settlements. Two places which come to mind by widening and extending existing roads are Ayer Rajah Road and Jalan Toa Payoh. Other expressways which were built by a new route method were SLE, BKE, CTE, ECP, KJE and KPE. When ready by 2015, the Marina Coastal Expressway (MCE) will be the first undersea road-in-the tunnel expressway. Ayer Rajah Road, fore-runner of the AYE, was between Gillman Circus and Clementi Circus, not to be confused with Upper Ayer Rajah Road as the section between Clementi Circus and Jurong Town Hall Road. Ayer Rajah Road was never appropriately considered as the first Singapore expressway when the public road infrastructure project got underway in 1962. It was a part of “Major Road Construction Projects” in Singapore at that time; meaning road widening and extension was all that mattered. So low was the priority that only S$0.385m was allocated for the Ayer Rajah Road project. As a child passing through this way many times over, the dramatic transformation of Ayer Rajah Road (into the AYE by the mid-1980s) and the surrounding landscape fascinated me. So I like to describe yesterday’s Ayer Rajah Road and its vicinity to you. We start with an aerial view of the area. How much has Ayer Rajah Road remains till this day? 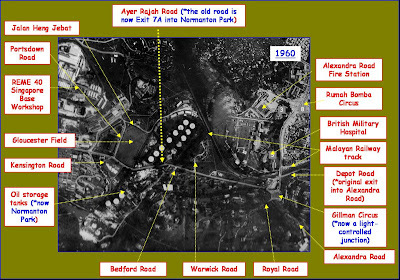 Further down Ayer Rajah Road on the opposite side of what is now Science Park 1, I saw British military personnel playing rugby at Gloucester Field; now Portsdown Avenue. Depending on the time of the year, you could also catch a game of cricket or football. In the 1970s the field became a practice site for archers. A place I found most interesting was a huge British military base at what is now the ST Automotive Inspection Center. It is only in recent times that I found that it was the REME 40 Base Workshop. It was the largest British military transport repair facility in Malaya, Singapore and Hong Kong. There were Bedford trucks, Centurion tanks and Humber PIG armored vehicles under the sheds and in the open yards. Sometimes you could even see a small shunter pulling a flat-bed trailer. Photo 2: What remains from this photo are the buildings at Woking Road, off Portsdown Road. They are shown at the bottom of the photo. Gloucester Barracks and Rowcroft Lines merged to become Science Park 1. The SAF 3rd Transport Battalion and ST Automotive/ST Engineering occupy the former 40 Singapore Base Workshop. The original Ayer Rajah Road are lanes one and two of the AYE in the direction of Jurong. Kent Ridge looked so much higher than what it is too today. Probably the thick vegetation mask what was truly a magnificent natural highland especially when seen during sunset. I saw many double-storey bungalows neatly spaced out on top of the ridge whilst below in the valley were the Malay kampungs and terraced rows of military accommodations. The bungalows up on Kent Ridge are now exclusively used by the National University of Singapore but it was once the home of the top British Army military brass. After the British Pull-out in 1971, it was used by the SAF top brass like Maj-Gen (Rtd) Winston Choo as his residence. I came to Ayer Rajah Road area one last time in 1978 when I collected my graduation gown at the Kent Ridge campus (Central Library). By this time, Clementi Circus was demolished and a light-controlled junction was in place. Thank goodness I drove otherwise I would have to walk and puff all the way from the bus-stop at Clementi Road to the Central Library. Photo 3: Kent Ridge viewed from the junction of Ayer Rajah Road and North Buona Vista Road. The senior British Army staff bungalows on top of Kent Ridge but today they belong to the National University of Singapore. The properties are numbered 1 to 10 Kent Ridge Road. The former North Buona Vista Road is at the bottom of the photo with a British Army military base on the right. National University of Singapore’s Faculty of Medicine (MD 11) and the roundabout at Lower Kent Ridge Road now occupy the settlement at the foot of Kent Ridge. I recall the time when the flyover joining North and South Buona Vista roads was being constructed. Incidentally, I checked my 1981 street directory. North and South Buona Vista roads were not joined together. How stranged. It must be after 1986 when this flyover was being constructed, because I was already working at NPB at its new building at Bukit Merah Central. I remember the horrific traffic jams caused by the road diversions here whenever I returned to NPB from Jurong. Around that time I also did some TQC training at SAE, or Singapore Automotive Engineering before it was renamed ST Automotive. My counterparts were the HR Manager and the QA Manager. I cannot recall the former's name, but I found out not long ago that the the QA Manager, Mr Khoo's daughter and my eldest daughter are the best of friends throughout their schools days and now in the NTU. Next article will be on PIE from Jalan Anak Bukit to Bedok North.